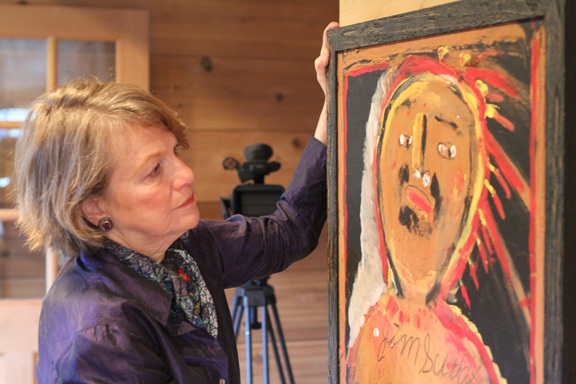 In the folk art world, the late Jimmy Lee Sudduth stands tall, a sweet man of enormous energy and spirit, prolific in raw paintings of mud on wood or cardboard. Patrons of the Kentuck Festival of the Arts remember his many years lingering in the shade of a pine, playing harmonica and chatting with patrons who snapped up every piece he’d paint. But it wasn’t so many years ago that Sudduth painted purely for the creation of it. He probably never suspected he’d someday be collected in the Smithsonian Institution, the American Folk Art Museum in New York, the High Museum of Art in Atlanta and many others. It took another avid artist born in the area, Lois Wilson, and the drive of newspaperman Jack Black to help light the fuse of the folk art boom with the Fayette Art Museum. A 12-year labor of love, “Treasures from the Rubble” premieres Thursday at the ninth annual Tupelo Film Festival, with an international premiere following in June at the 10th anniversary Female Eye Film Festival in Toronto, Canada. It began in 2000, when Branyon came back to her alma mater to receive a Distinguished Career Award from the Society for the Fine Arts at the University of Alabama. The Fayette native who now lives in Amagansett, N.Y., has worked as an actress, musician and journalist, doing summer stock, dinner theater and musical comedy for Joseph Papp’s Public Theater. She’s studied composition at Juilliard, voice with a Metropolitan Opera tenor, and acting with Lee Strasberg’s private class; played piano with a theater orchestra in Honolulu and studio bands in New York; and has taught playwriting at the New School for Social Research in New York. All her skills came together in “Treasures from the Rubble,” which she wrote, directed and produced. Black had been publisher and editor of the Fayette County Broadcaster when Branyon edited the Fayette County High School newspaper. Black became a mentor to the young woman. He introduced her at the Society for the Fine Arts banquet, and they talked after. “For the last 35 years, he’d been creating an art museum in Fayette from the work of this fascinating woman, Lois Wilson,” Branyon said. Like many folk artists, Wilson was born poor, and worked with whatever materials she could find. Born in 1905, she did go on to study formally, but kept the same primal drive. Wilson’s desire to keep in one place her art, and those pieces she’d collected, led Black to create the museum. She donated more than 2,700 works of art to the cause. “I said to Jack Black, ‘I’ve never done a documentary before, but guess what? I’m going to do it,’ ” Branyon said. She intended the film as a tribute to her hometown, and to people like Black and his wife Margaret, who was Branyon’s high school English teacher. Principal filming took place that year, but having no big financial backing, Branyon wound up doing much of the work herself. She did take along longtime friend and collaborator Margaret Kitchings, who composed music and wound up playing an inspired part. Black took them through every piece in the museum, and they interviewed him and others. Sudduth, who died in 2007, was captured on film not just talking, but performing. Wilson had prompted Black to give Sudduth his first one-man show, which got everything started for him. The director wanted her at the heart of the film, but because the artist had died in 1980, and was no fan of being photographed, there wasn’t footage to use. Branyon had an inspiration. She looked over at Kitchings. They went out and bought a simple dress, a big plain hat to hide the face, and the composer, who had studied acting earlier in life, stood in as the Lois Wilson figure, drifting through black and white scenes while Branyon read voice over. Later, Kitchings scored scenes for emotional content, working closely with Branyon. She’d put the melodies down on piano, then consult with the director on what worked. Back in Amagansett, they put together a small band and spent about five days recording, with piano, flute and other instruments. The Dixieland-style closing track includes John Bucher, who plays horn in Woody Allen’s band. Post production ate up the years. Although she’d have liked to have shown it first in Fayette, film festivals are picky; if it had shown anywhere publicly, it couldn’t be labeled a premiere. She was very pleased that Tupelo, not a long drive from Fayette, picked it up. The Canada acceptance surprised her. Branyon hopes to show the documentary at the Fayette Art Museum in August or September, and continue to work to get it seen, even as she works on other projects. This entry was posted in Media by Alexandra. Bookmark the permalink.